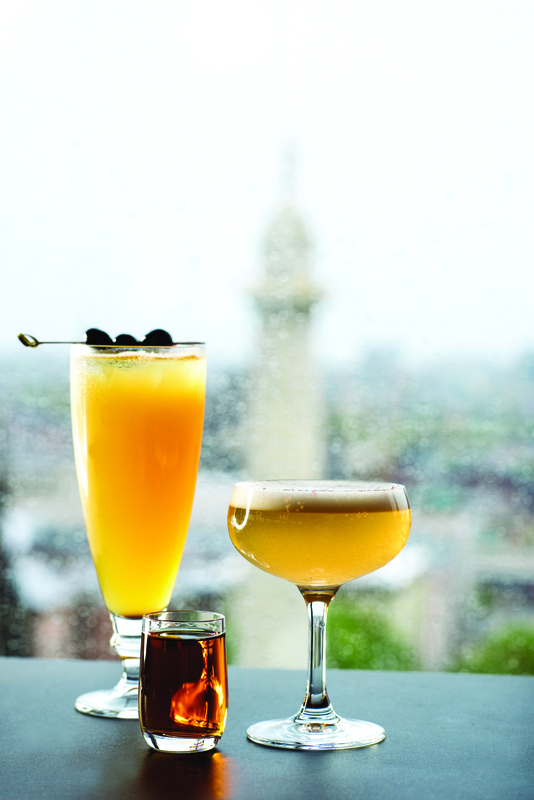 Sitting on the top floor of the Hotel Revival, you’re surrounded by Baltimore—literally and figuratively. Windows on three sides reveal views of Mount Vernon Place, including the iconic Washington monument to the east. The View north captures the Meyerhoff Symphony Hall and the Maryland Institute College of Art; and to the west you can see past the Maryland Historical Society to Martin Luther King Boulevard. In the Topside restaurant kitchen, Highlandtown-born Chef Wilbur Cox, who attended Baltimore International College (the downtown culinary school now called Stratford University), stocks his larder with products from nearby farms and fisheries. And the bar pours local beer from Brewer’s Art, Union Craft and Peabody Heights—the latter makes a special pale ale whimsically named Revival Thirstay. You can also order a Union lager with a shot of local single malt whiskey on the side. Yes, local single malt whiskey. The category of American single malt is so new that it has only recently been defined. In fact, the American Single Malt Whiskey Commission was founded in 2016 to do just that. The designation requires that 100 percent malted barley be distilled at a single distillery in oak casks no larger than 700 liters (about 185 gallons). 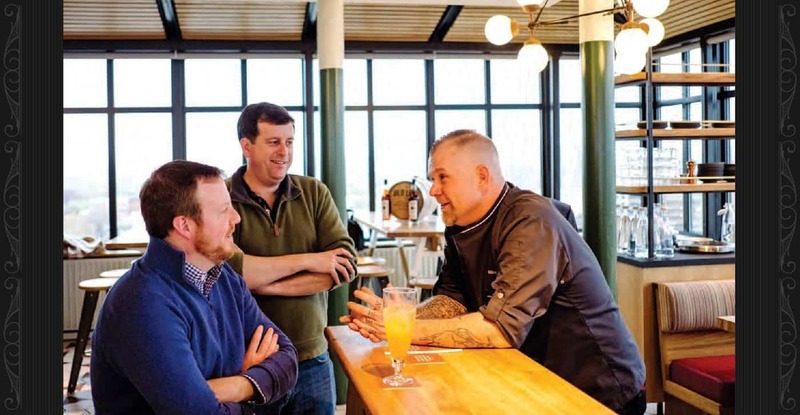 Old Line founders Mark McLaughlin, left and Arch Watkins chat with Wilbur Cox, executive chef, in the Hotel Revival’s restaurant, Topside. The two had met in the early 2000s as co-pilots in the Navy, flying side-by-side in a Northrup Grumman prowler, an aircraft used for electronic warfare. “Think Top Gun,” says McLaughlin. After going their separate ways—McLaughlin to business school and a career in finance, Watkins to engineering, a field he’d trained in before enlisting—both ended up in Baltimore, where they joined a few other former Navy buddies in the Butcher’s Hill neighborhood. Though he learned a lot from investment banking, McLaughlin wasn’t satisfied. “I wanted to create something tangible,” he says. “I love whiskey and the market was going in the right direction.” Watkins joined him without hesitation. “Being a distiller checked a lot of boxes for me,” says Watkins, who had been working at the Johns Hopkins Applied Physics Lab in Laurel. “I love brown spirits, and while the whiskey market is very good, I thought we could offer something different.” They purchased an existing distillery in Washington state and relocated it to Baltimore in 2014. In 2017, the nascent Old Line Spirits won a best in class for their single malt from the Seattle International Spirits Awards. I first met McLaughlin and Watkins at a party at the distillery, in what was once a commercial laundry building on a dead end street in Highlandtown. They were hosting the owners and staff of the yet-to-open Revival to introduce a special edition single malt in partnership with the hotel. Each attendee had the chance to usher a bottle through the process as it was filled with butterscotch liquid, stoppered with a cork, and then rolled across a labeler—each label numbered and bearing the Revival logo. Even the name, Watkins tells me, is a nod to the military. Members of the Maryland regiment of George Washington’s army were known as “the old line” for their bravery at the Battle of Long Island in 1776. At the bottling party, we sampled popcorn glazed in caramelized Old Line whiskey and chewy bourbon blondies made by Shalonda Berry, executive sous chef for the Revival Hotel’s restaurants. Beverage manager Chelsea Gregoire mixed a cocktail she’d concocted for the occasion: The Tailspin, with Old Line whiskey, allspice syrup, dry curaçao, lime juice and burlesque bitters. A promise of things to come—such as Gregoire’s Not a Preakness cocktail, with Old Line, sweet vermouth and Drambuie, which I tasted on a recent visit to Topside. 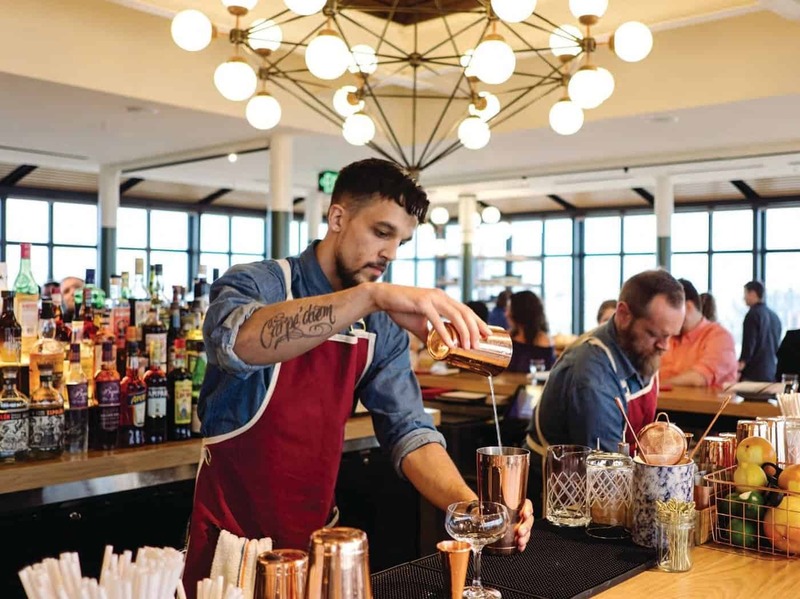 Opened in May, the Revival is owned by Joie de Vivre, a San Francisco-based company with two dozen or so boutique hotels, mostly in California. Well before the Mount Vernon location opened, its staff scoured Baltimore for products that would link it to the community. This was no token Old Bay, Natty Bo and Berger cookie homage. The hotel commissioned sturdy canvas aprons for its bartenders from Treason Toting Co., bow ties for doorkeepers and valets from the Baltimore clothier Christopher Schafer, flowers from B. Willow in Remington and a massive lobby mural by Artstar Custom Painting. Topside cocktails made with Old Line spirits include, from left, Shandy You’re a Fine Girl, Shrubs and Rose, and a boilermaker with Old Line Whiskey and cola syrup. Baltimore’s Washington Monument is in the background. The hotel’s two eateries—Topside on the 14th floor and Square Meal on the ground level—are both helmed by Cox, who has worked at the Admiral Fell Inn, Ixia, Charleston, Bicycle and B&O Brasserie (the latter two as chef de cuisine), among others. In spite of Topside’s dreamy views, Cox is determined to keep it real. “You’re not going to come in here and raise your pinky as you drink,” says the chef. The menu at opening included brat-wurst made from Liberty Delight Farm pig ears, served with dollops of apple ginger jam, pickled mustard seeds and celery root purée. The Reisterstown farm also supplied the pork jowl, which Cox describes as “pork belly on steroids,” accompanied by a bacon broth with little neck clams. A whole fried blue catfish “is an interactive dish,” explains Cox, as he uses a piece of the accompanying bread to demonstrate pulling a piece of fish from the bones to dip into a shoyu sauce (which Cox makes in the hotel’s basement from discarded beer). The menu downstairs at Square Meal is less meat-centric, with an array of salads, grain and pasta-based dishes, and warm vegetable plates, along with a few protein entrees like duck and rockfish. Topside bartenders Dante Reavers and Ian Clark mix things up. Even in the world of single malt whiskey, with roots in staid Scottish tradition that dictates single malt Scotch be aged for a minimum of three years (though convention is more like 12-14), a nimble American company like Old Line Spirits can respond to changing tastes more quickly. “We’re not beholden to as many rules,” McLaughlin points out. Cox shows up at our table with sweets—churros with mole chocolate sauce and ice cream sandwiches made from white chocolate and cherry cookies with brown sugar Ice cream. Watkins and McLaughlin pull out a bottle of their aged Caribbean rum, which Old Line makes in collaboration with a couple in Texas. The stuff is warm, buttery and sweet, easily dessert on its own, but a delicious complement to the treats from the kitchen. There’s also an ice cream float made with tea ice cream and hibiscus mead from Charm City Meadworks—another local company tapped by the Revival staff. 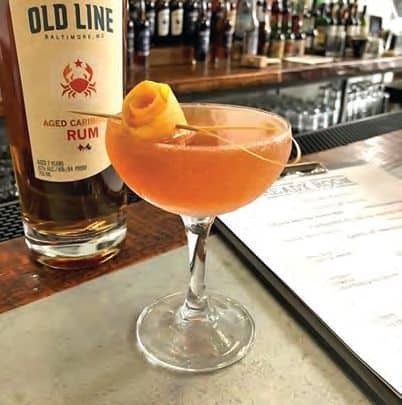 In June, Old Line Spirits transformed the tasting room of its East Baltimore distillery into the Ready Room, named for the place on a Naval vessel where crew members receive instructions or discuss what happened. Old Line owners Mark McLaughlin and Arch Watkins planned the new bar to take advantage of a shift in distillery license regulations. McLaughlin and Watkins figured the new Class 9 Limited Distillery license, which presumably allows distilleries to obtain a tavern license, would make the process of transitioning to the first bar within a Baltimore distillery as smooth as an aged single malt. But, according to McLaughlin, it wasn’t that easy. With the opening of the general assembly just two weeks away, the Old Line owners learned that the language in the Class 9 license did not override the city’s moratorium on new tavern licenses. At the last minute, Old Line was able to craft language to attach to a bill in the distillery’s district. “We were gasping for air at that point,” recalls McLaughlin. The Ready Room serves up a menu of cocktails from the Old Line Old Fashioned to the zombie-inspired Liberty Risk, made with Navy-strength rum. The bar, which also continues to function as a tasting room, is at Old Line Distillery headquarters, 4201 East Pratt Street, oldlinespirits.com. —M.T.